As I prowled the remote mixed-grass prairie of northwestern Oklahoma in the middle of the night, an enormous, serpentine figure emerged frenetically from a clump of grass and clambered up the banks of the draw I was exploring. Although I was still hoping for my first glimpse of the Great Plains giant tiger beetle, I was keeping a watchful eye out for anything that moved within the illuminated tunnel of my headlamp due to the potential for encountering prairie rattlesnakes (perhaps the most aggressive of North America’s species). This was clearly no snake, but at up to 8″, Scolopendra heros (giant desert centipede) easily matches some smaller snakes in length. Also called the giant Sonoran centipede and the giant North American centipede, it is North America’s largest representative of this class of arthropods (although consider its South American relative, S. gigantea – the Peruvian or Amazonian giant centipede, whose lengths of up to 12″ make it the largest centipede in the world). Although I had never before seen this species alive, I recognized it instantly for what it was. Many years ago I was scouting the extreme southwest corner of Missouri for stands of soapberry (Sapindus saponaria), a small tree that just sneaks inside Missouri at the northeasternmost limit of its distribution, in hopes of finding dead branches that might be infested with jewel beetles normally found in Texas. I had heard that these centipedes also reach their northeastern extent in southwestern Missouri, and just a few miles from the Arkansas and Oklahoma borders I found a road-killed specimen. I stood there dejected looking at it – too flattened to even try to salvage for the record. Centipedes, of course, comprise the class Chilopoda, which is divided into four orders. The giant centipedes (21 species native to North America) are placed in the order Scolopendromorpha, distinguished by having 21 or 23 pairs of legs and (usually) four small, individual ocelli on each side of the head (best seen in bottom photo). The three other orders of centipedes either lack eyes (Geophilomorpha) or possess compound eyes (Scutigeromorpha and Lithobiomorpha). These latter two orders also have only 15 pairs of legs (shouldn’t they thus be called “quindecipedes”?). Among the scolopendromorphs, S. heros is easily distinguished by its very large size and distinctive coloration. This coloration varies greatly across its range, resulting in the designation of three (likely taxonomically meaningless) subspecies. 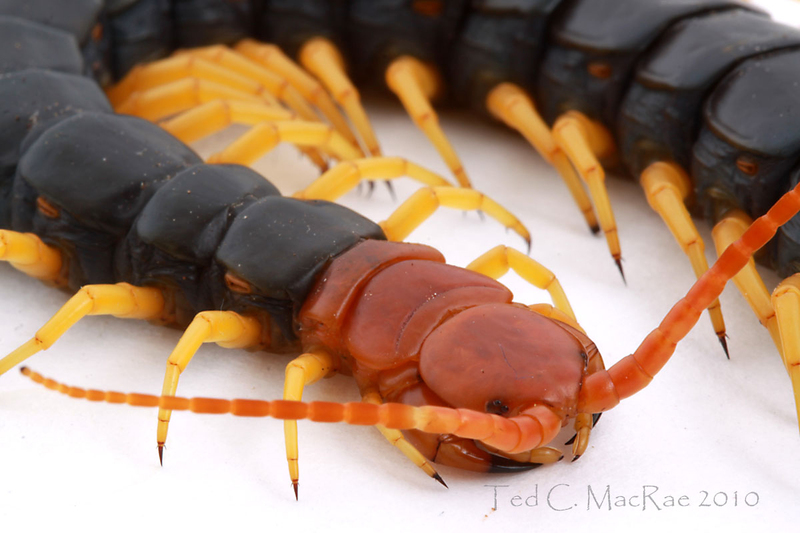 This individual would be considered S. h. castaneiceps (red-headed centipede) due to its black trunk with the head and first few trunk segments red and the legs yellow. As we have noted before, such striking coloration of black and yellow or red nearly always indicates an aposematic or warning function for a species possessing effective antipredatory capabilities – in this case a toxic and very painful bite. The individual in these photographs is not the first one I saw that night, but the second. I had no container on hand to hold the first one and not even any forceps with which to handle it – I had to watch in frustration as it clambered up the side of the draw and disappear into the darkness of the night. Only after I returned to the truck to retrieve a small, plastic terrarium (to fill with dirt for the giant tiger beetles that I now possessed) did I luck into seeing a second individual, which I coaxed carefully into the container. It almost escaped me yet again – I left the container on the kitchen table when I returned home, only to find the container knocked onto the floor the next morning and the lid askew. I figured the centipede was long gone and hoped that whichever of our three cats that knocked the container off the table didn’t experience its painful bite. That evening, I noticed all three cats sitting in a semi-circle, staring at a paper shredder kept up against the wall in the kitchen. I knew immediately what had so captured their interest and peeked behind the shredder to see the centipede pressed up against the wall. The centipede had lost one of its terminal legs but seemed otherwise none the worse for wear – its terrarium now sits safely in my cat-free office, and every few days it enjoys a nice, fat Manduca larva for lunch. There are a number of online “fact sheets” on this species, mostly regarding care in captivity for this uncommon but desirable species. I highly recommend this one by Jeffrey K. Barnes of the University of Arkansas for its comprehensiveness and science-focus. Photo Details: Canon 50D (ISO 100, 1/250 sec) w/ Canon MT-24EX flash in white box. Photos 1-2: Canon 100mm macro lens (f22), indirect flash. Photo 3: Canon MP-E 65mm 1-5X macro lens (f/13), direct flash w/ Sto-Fen + GFPuffer diffusers. Post-processing: levels, minor cropping, unsharp mask. This entry was posted in Chilopoda, Scolopendromorpha and tagged centipedes, entomology, Great Plains, insects, nature, North America's most..., Oklahoma, prairies, predator avoidance, science, warning coloration. Bookmark the permalink. Wow! Very impressive. Did he slow down at all? The little stone centipede I photographed last year was in constant motion in the white box, making it a very difficult target indeed. What does this size centipede prey on in the wild? I found that if I put a large glass dish over the centipede and left it for awhile, it eventually settled down and then stayed put while I carefully lifted the dish. In the wild I suspect they probably eat a lot of crickets and grasshoppers. Great photo! I see these regularly in southeast Arizona. They are popular for use in live displays. I can’t believe in all the times I’ve been to Arizona for collecting (’87, ’91, ’98) I’ve never run into one of these things. Their popularity for live displays is certainly understandable – creepy-beautiful and very easy to keep. OMG that centipede is so awesome! I love its coloration, but I love its size even more. NEVER have I seen a centipede so large. Stunning photos – boy, Ted, you’ve really got that macro photography down! Maybe I’m super-impressed with size because I live in Texas? Thanks, Amber. I wouldn’t say that I’ve got the macro thing down, but I’m learning. In fact, I’ve got a followup in the works with direct comparisons of different lens and lighting methods – you should find it interesting. I’ve seen many heros while looking for snakes in Arizona, and see a good amount of S. heros arizonensis. I’m into the herpetology more than the entomology, but these still require some attention! What is the ssp. called that has this coloration? All I’ve seen is arizonensis, which is red with a black head. Hi Bryan – the black with red heads form is called castaneiceps, which covers the greatest part of the species range. btw – very nice herper’s website you’ve got. Link and RSS feed added. Thanks for the info. Inverts are on that fringe of my interest that keeps growing over time … probably the same way most entomologists are with snakes! haha. Thanks again, and likewise added to my list. You’re welcome. Yes, indeed – I’ve had a growing interest in herps (esp. snakes) over the past couple of years, probably a result of me actually finding some pretty cool ones. Still, I’m glad I didn’t run into any prairie rattlers that night! I ran into a mess of them in the Black Hills one time – I got some great photos of the first one, but the second encounter was a tad too close for comfort and had me tip-toeing out of there in short order. That’s just cool. I will hopefully be in Colorado next Spring to set up a lawn chair and spend a few days at a C. viridis den … they do it in larger masses than down here in AZ. Also, if you’re interested in info on finding S. h. arizonensis in AZ if you ever come down, let me know and I can give you a couple of good locations. I’ve been wanting to get back out to AZ for awhile now. I’ll certainly drop you a note when I’m ready to go out there – there might be lots of other good “bugs” for me to find at whatever locations you can recommend. What a gorgeous and formidable critter, Ted! Very nice find and beautiful pictures. We come across these on occasion in AR while looking for snakes. 1) Their bite is for real! A friend of mine was bitten on the knuckle of his middle finger and his arm swelled up to the elbow. 2) They seem to NEVER STOP MOVING when you want to take their picture. 3) They easily chew out of Ziploc bags. 4) They will devour frozen/thawed mice of appropriate size. Thank you, Kory. I’ve heard more than a few stories about how painful the bite is – sometimes these things get exaggerated, but in the case of these animals the reputation seems quite deserved. I’m sure water and preventing desiccation are paramount for keeping them in captivity. I placed a cotton-filled dish in the terrarium and keep it saturated with water, but probably if they are fed often enough they will get the water they need from their food. I’ve had mine for 2 months now. p.s. – Herps of Arkansas is a great site! Great shots of a striking animal. I used to have a Scolopendra of similar size (but less colourful) in Queensland that I used as a demo for Entomology and Invertebrate Zoology labs. The students (and I) were always impressed by how fast and supple the centipede was – nothing stilted or robotic in the movement of this arthropod – and also how fast it would strike and devoured a large cockie (or you might call them palmetto bugs – Periplaneta americana). The Australian Scolopendra also have some spectacular mites in the genus Discozercon: they may be present on your animal too (I know of records from Arizona). Alas, no wild Scolopendra in Alberta (but no synanthropic cockroaches either). Where would I look for the mites? I haven’t noticed anything as obvious as those on my hissers (Gromphadorina portentosa). This thing almost gives me the willies to handle – even with long forceps, it moves with such rapidity it seems like I’m always just barely keeping it under control. The first time I put a caterpillar in the cage, it hadn’t fed for several days – the strike was quite forceful and deliberate. Alas, no wild Scolopendra in Alberta (but no synanthropic cockroaches either). Gorgeous photographs, Ted! Its amazing to see a centipede frozen in time, as they are such fast moving creatures. Thank you, zack. I would prefer to have gotten photos like these out in the field (don’t know what it is about me and my desire to photograph things in their native haunts). One thing I will say about the white box environment is that it really does highlight the beauty of the creature. Awesome photos! These guys are so cool. They used to be uncommon here around Dallas, but they’ve been increasing their numbers recently. It’s gotten much easier to find them in and around the city, though they’re still more common to the south. At least for now. So glad you had a second chance to grab one, Ted! And I laughed about the cat story. One joy of having cats is that they’ll always let you know where to find the critters. Thanks, Jason. Lucky you with the opportunity to see these things regularly. I figured you’d appreciate the full humor of the cat story. It’s almost comical the way they sit together and stare at something when there’s a critter hidden behind it – something I’ve gotten to witness over and over since childhood. Oh, I remember them from when I lived in Oklahoma. We would see them indoors as well as out. Can’t believe four little kids managed to walk around barefoot for years and never get stung. Great photography, but I would never get that close! Hi Sandy – you probably never got bit because, for all their ferociousness as predators and in appearance, they really are secretive animals that would much rather avoid conflict. The coloration is a warning for potential predators to leave them alone, and given the choice when threatened they will try to flee – only when handled do they resort to biting. I had nothing to fear while taking these photographs (other than it suddenly bolting and escaping the confines of the white box :)). Ted, what fantastic fotos! A real movie opening your site. Great pictures! The color is amazing. One of my students brought me one of these 2 years ago, but I wasn’t in my room, so he left the jar sitting on my desk. I didn’t see it amidst the clutter at first. I caught its movement in my peripheral vision while I was typing, and thought I was going to have a stroke when I saw its gigantic self sitting there, before I realized it was imprisoned. Thanks, Joy. I’m jealous – I have to drive hours to see these, and they just magically appear on your desk! This is very fascinating, You’re an overly skilled blogger. I’ve joined your feed and look forward to in the hunt for more of your excellent post. Additionally, I’ve shared your website in my social networks! I don’t understand why you would want to exterminate them. I agree! I find these wonderful beasties on holiday in The Mediterranean countries. But all they want to do is escape. A lot of nonsense is written about how formidable they are — they just want to be left alone. They are quite lethargic at low temperatures — which gives you a false sense of security, but in the heat their legs hardly touch the ground ! Wonderful pictures –as usual –I must remember to visit this website more often. Thank you for the nice comment, and welcome to BitB! Hi Jennifer – I’m not surprised, these centipedes extend up and east into southwestern Missouri. They are impressive animals! Looks a lot like a Japanese Tobizu-Mukade. I have been loving on centipedes for the past few days outta nowhere and then one (a little brown one lethi-so-and-so) showed up in my hallway and made friends. Not sure where my sudden love for these creatures came from but they deserve it! My husband works for an oklahoma pest control company, and out on a call he came across one of these centipedes, and I thought I would look it up to see what type of centipede it is, and yes it’s alive sitting in a tightly sealed container in front of me. It doesn’t look to happy either! Being I don’t like the looks of it I still have enough heart to have my husband find a safe place far from my home to let it go. I hope your husband does let it go outside – they are not pests and have their place in nature. Any centipede of this type that happens to be found in a home is there by accident and wants to get out just as badly as the homeowner wants them out. I have lived in SW Missouri for 30 yrs, in a very rural area, close to Table Rock Lake. Until this week I didn’t even know this species even existed. In the past week I have had the pleasure of meeting not one, but two of these prehistoric-looking fellas. I took a job at a resort which sits bluff-side on the lakes main channel. Upon walking into the resort’s restaurant for work one morning last week I was greeted by the one of these, scurrying across the floor from behind the bar. Now Im not scared by much, but I did a dance that any sissy would be proud of.We managed to remove it via dustpan & broom. The second found its way into the kitchen two days ago. Our chef did a similar dance…The first was easily an inch across(not counting legs) and at least 8 inches long, the second, only slightly smaller. From what I’ve gathered they are seen often on the resort… If anyone is interested in a live specimen, email me-mommycarr79@gmail.com. I’ve not heard of these invading homes, as in Missouri they are fairly restricted to the dry, rocky dolomite glades that dot the hilltops in your part of the state. Does the resort have this type of habitat nearby? I’d love to get a live one if you can manage it. When I lived in TX, in 1999 I worked in a nursing home. One of the CNA’s opened a closet and a outrageously large centipede fell from the shelf. She came screaming to the nurses station that there was a huge bug in the hall. I looked down there and it appeared about the size of a small dog. I got a broom, and pushed it out the door into a garden area. This monster was about 2 feet long and about nearly a foot tall. He has antennas the size of fingers. He had a brown body and yellow legs. I had never seen anything like it before or since. Maybe it seemed that big, but there are no centipedes anywhere in the world that are even close to that size. well, it appeared to be a centipede. It definitely a bug and it definitely WAS that big. As I stated, I had to use the broom to push it out the door. It was as tall as the top of the bristle head of the broom and twice as long. It moved in a “s” movement and had a ton of legs. It was heavy, too as I pushed against it. It was not aggressive. The largest centipede in the world is Scolopendra gigantea from South America, which reaches a maximum length of 13 inches. 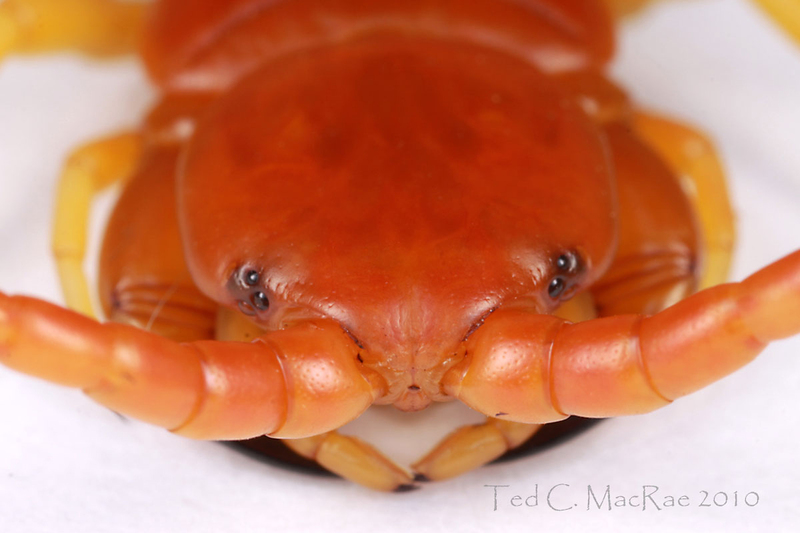 The only other terrestrial arthropods that reach any size are millipedes, insects and crabs. The largest millipedes in the world (Archispirostreptus gigas from Africa and Scaphistostreptus seychellarum from the Seychelles islands) reach a maximum of only 11 inches in length. The longest insect in the world is a walkingstick, Phobaeticus chani from Borneo, which tops out at 14 inches in length. There is one terrestrial crab that actually can reach the size you state – the coconut crab, Birgus latro, with a leg span of up to 3 feet. However, these crabs are restricted to lightly populated islands across the Indian Ocean and parts of the Pacific Ocean. So again, while the centipede or whatever you saw may have SEEMED very large to you, it simply couldn’t have been anywhere close to 2 feet long. I appreciate the research you have found. I would agree with you except that I had a measured reference (the broom). I know what I saw. I know what I pushed out the door with a broom was beyond anything I have found or research. Unfortunately, it was a time before smart phones and being at work, a camera wasn’t accessible. The research I have done, stated that there have been rumored larger ‘pedes but they have not been documented. The one I saw looked like a PERU centipede (Scolopendra Caribiaenensis) that has been documented up to 42cm or 16.5 inches. 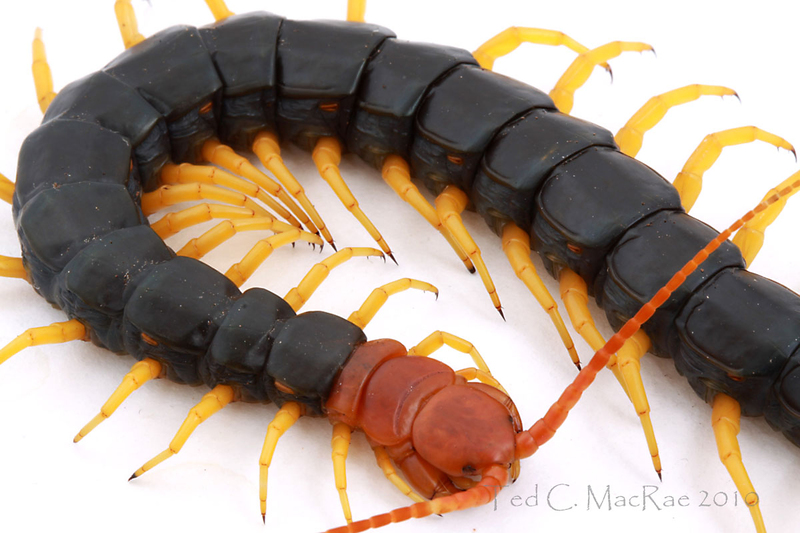 I’ve never heard of “Scolopendra Caribiaenensis“, which doesn’t appear in any of the taxonomic references available to me online or in my library. Googling the name brings up only a short list of pages – all with the same photo and identical text stating that quite remarkable size (which still falls short of your 2-foot claim by nearly 8 inches!). As we all well know, however, the internet is rife with misinformation – especially with regards to large arthropods that are commonly encountered in the live pet trade, and I’m afraid your “Scolopendra Caribiaenensis” is actually an invalid name coined by a livestock dealer for stock offered for sale. Most likely it refers to Scolopendra gigantea, which IS the Peruvian centipede. Livestock dealers are known to sometimes exaggerate the maximum size of the stock they sell, but with regards to centipedes there are no credible references in the scientific literature for individuals reaching more than 13 inches in length (there are, however, fossil species known that may have been as large as 8.5 feet!). I hope you’ll forgive me for persistently pushing back against your claims, but this blog serves, in part, an educational purpose, and I would be remiss if I were to let such fantastical claims go unchallenged. Ted: S. heros gets about three inches longer than your note of 8″–I know this from personal experience as we kept a monster at ASU when I was an undergrad that measured nearly 11″ (actually measured, not an estimate), and we found one about 10″ while road cruising for herps one night (an my friend found out that grabbing it with 12″ forceps was the wrong thing to do!). Those were exceptional specimens though. We used to feed the big one pinky rats which would die in about 5 seconds from being bitten by the poison jaws. I personally was bitten by a small specimen: We used to pick up the 3-4″ ones because they couldn’t get their poison jaws through the thicker skin of one’s hands, but I found out the falsehood of that logic when one got a single poison jaw through the thinner skin on top of the basal joint of my index finger–stung like nobody’s business–and the whole joint turned black and swelled up 50% in about a half hour. Fortunately the pain/swelling/color change abated after a day or so. Hi Bill – see my response below (this reply thread is getting too skinny!). TED, did you ever get yourself a live one? I live in Hinton Oklahoma and have seen an over abundance of them this year! The last one was last night, and it was 6+ inches maybe 7 at best long,my daughter-inlaw dispatched him with a brick, but kept him on the picnic table for me to look at today. It was quite the specimen most of the ones I’ve seen this summer where brown/black, ( of course yellow legs and orange head) , but this fella was a dark green color! I would be happy to catch the next one I find, and send it to you. I’d even pack it a lunch! Hinton has lots of sand and sandstone, pretty dry for the most part, and we have had a grasshopper bloom this year, so they are well fed this year ! Nice photography, and Ivan say that with authority, as I’ve been in the pictur biz since about 1968 . ( I am still fighting digital) ! Film is where it at! I kept the one I photographed for a few months before it finally died. I don’t think they live all that long anyway – captivity wasn’t a problem since I had an endless supply of food to give him. Thanks for your remarks about my photography, although I’ll note that 2010 when I took those photos was only my 2nd year doing it – I’ve learned a lot since then and would love to get another crack at photographing one of these things now. If I get another chance to collect a live one ( my daughter -inlaw has been advised to not kill anymore) I will email you, and I would be happy to mail it to you. I feel I’ll run across another FEW before winter sets in . Happy hunting in the meantime! I really envy you Americans for having all these wonderful creatures. UK has the most impoverished wildlife in Europe — perhaps anywhere. I have to go abroad to find anything like this. So don’t end up like the UK — don’t destroy them. Hi Bill – even if your ASU pet really did measure nearly 11″, that is still well below half of the length that Tonya so tenaciously claims for her Texas critter. I remain convinced that her claim is patently untrue. 2 ft. is beyond the pale; absolutely NO WAY. Totally impossible. 11″ also seems a stretch to me, because only S. gigantea in South America is known to get that large. Even in captivity, I find that unbelievable. I would want documentation, like a photo with the centipede along a ruler or something. How did they measure it anyhow, because it would bite the HELL out of anyone who tried to hold it still. I have never heard or seen of one greater than 8″. and anyone claiming otherwise will have to provide documentation for me to accept their claim. Short of documentation, I would totally dismiss such claims as another “fish story” of the one that got away. I don’t have to provide any documentation, I was not arguing, just stating what I saw. I could have made a similar argument to Shelley’s about Dynastes granti not getting much past 8.5 cm based on history…until I saw larger ones from more southern areas of its range in Mexico… In any event, hat black bodied form of S. heros is very striking–we see the yellow (save for head and tail ends) form around here–nice photos. I’m hoping you can help me identify a centipede my daughter and I saw on the stone path in front of our home in Rudy, Arkansas (very rural and wooded). I’ve been searching the internet and all I can find for this area are the S. heros with black body and yellow legs (and possibly the red-headed – not sure if I read that one was here). Anyway, neither of those is what we saw. Ours had a black body with a red head and matching red legs. It was clearly black and red, NO YELLOW. It was at least 5″ long with a body of maybe a half inch wide. We tried to get a picture of it – my daughter manning the phone camera and me trying to heard it with a stick to keep it on the path, but it was just too fast and made its way to some tall grass and disappeared. Do you have any idea what species it might have been and whether not it might be dangerous? We were very surprised to see it because although this year was our first summer in the house, I worked outdoors everyday from June through September and never saw one until today (Oct. 14). Hi Kat – the centipede you saw is the same thing. Color can be quite variable, especially between the orange and yellow areas. They can give a painful bite, so it is best not to try to pick them up, but otherwise they cannot be considered dangerous – i.e., they do not pose a threat simply by living in the area around your house, as they are quite secretive, prefer to flee rather than fight when confronted, and show no inclination to come inside houses. Personally I would be quite thrilled to know that they were around my house, as it indicates a healthy habitat with intact food webs. I found an 8 inch North American giant centipede in my bedroom!! I see these occasionally (very occasionally) on my forays into the Great Plains each summer. Next time I see one I’ll let you know.